Sam Jefferies is a former federal lobbyist, and has managed issue campaigns at all levels of government. He currently chairs the crisis practice at Nyhus Communications in Seattle. Originally published Dec 28, 2017 on RealClearPolicy.com. Taking credit is a funny thing, especially in politics. Legislative or governance achievements rarely follow a linear arc, with cause, effect, and primary actors clearly delineated for all to see. Nor do such achievements necessarily translate into wins at the ballot box. Especially now that congressional Republicans have passed tax reform, it bears reminding that legislative achievements don’t always resonate with voters as much as their champions might hope. Democrats held the House, Senate, and White House in 2009 and used their political muscle to pass the painfully named American Recovery and Reinvestment Act (ARRA), colloquially known as the “stimulus bill.” Passed in the depths of the Great Recession as the economy gasped on life support and the global financial system was beginning to falter, the bill was enormous. It included $832 billion in stimulus funds, which paid for everything from expanded rural broadband access to renewable energy projects to roads, bridges, and all of the other desperately needed — if unexciting — improvements to fix America’s crumbling infrastructure. The ARRA also included a one-year, $800 tax break for 95 percent of working families — a detail that was forgotten as quickly as the money was spent. A year after the bill’s passage, only 12 percent polled believed their taxes had been reduced, and twice that many, 24 percent, thought their taxes had increased. While there remained broad support for the basic provisions of the bill, including working-class tax cuts and shovel-ready infrastructure investment, Democrats could not or would not salvage public perception. ARRA soon became a toxic pall hanging over the administration. As The New Yorker’s John Cassidy pointed out in 2014, “Perhaps the biggest indictment of the stimulus is President Obama’s continued silence on the subject.” Cassidy continued: “Sometime in his first term, [President Obama] appears to have decided that taking on the critics and attempting to educate the public wasn’t worth the bother. The word ‘stimulus’ only rarely passes his lips.” A few projects clearly named after the politicians who supported their funding —the Barack Obama Bridge or the Harry Reid Highway — may have really helped swing-district members of his party in the 2010 midterms. Instead, Democrats ended up losing even more seats than it did in the Republican Revolution of 1994. If ARRA wasn’t the reason they lost, it certainly didn’t help. Can Republicans expect the same treatment of indifference or hostility to their tax bill? Maybe. The bill remains deeply unpopular, with nearly twice as many Americans disapproving of the plan as approving, according to a recent Yahoo Finance poll. Much of this stems from the not unfounded perception that the cuts will disproportionately benefit the rich. Congressional Republican leaders have openly admitted their desire to placate the party’s donor class. For instance, in a rare moment of honesty in D.C., Rep. Chris Collins of New York remarked that “My donors are basically saying, ‘Get it done or don’t ever call me again.’” By contrast, they’ve ignored the key constituencies that delivered the GOP into power in the first place. 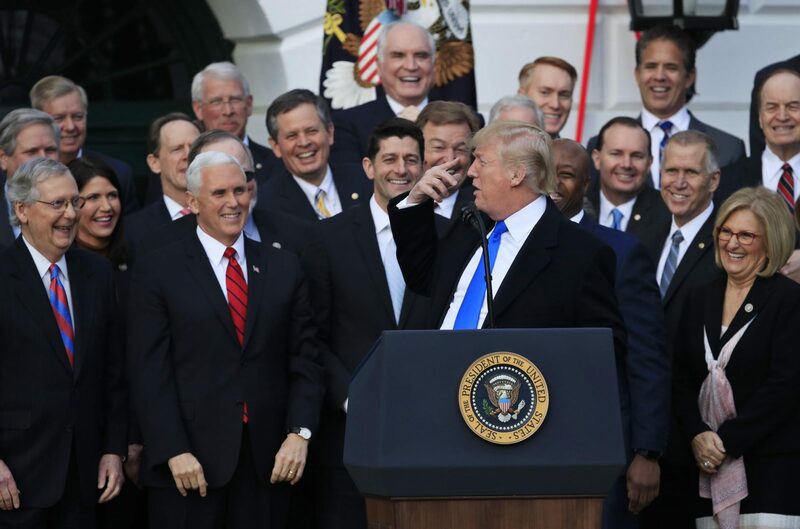 In Wisconsin, the state that swung the Electoral College to Donald Trump, a recent headline declared “GOP tax cuts generate little excitement in blue-collar county that swung hard for Trump.” The Salt Lake Tribune, the largest newspaper in a state that went for Trump by less than 50 percent, published a stark editorial earlier this month: Utah doesn’t need a tax cut. So much for the fervid excitement that a “great, big, beautiful Christmas present” from the president should bring to his most important supporters. These voters are right to be skeptical. The White House and GOP leaders have leaned heavily on rhetoric about the benefits of individual tax filings to build support on Capitol Hill, promising they would be simple enough to be completed “on the back of a postcard.” Americans expecting such simplicity come April 15th may be sorely disappointed. Even more importantly, the bill focuses largely on corporate taxes, with more than half of individuals projected to pay even more than they are now by 2028, unless the cuts are extended. Political risk is compounded when rhetoric and reality are so far apart. Economists have argued that ARRA saved or created 2.5 million jobs and kept the unemployment rate from reaching 12 percent in the depths of the Great Recession. The Obama administration wrongfully assumed that its effects would speak for themselves. Democrats paid an enormous price for that assumption. If the GOP makes a similar mistake with their credit-taking efforts on tax reform — made even more challenging by the “hastily revised” policy in question — their past electoral successes could become a distant memory.